How many stars live in our galaxy? This is actually a surprisingly tricky question to answer. 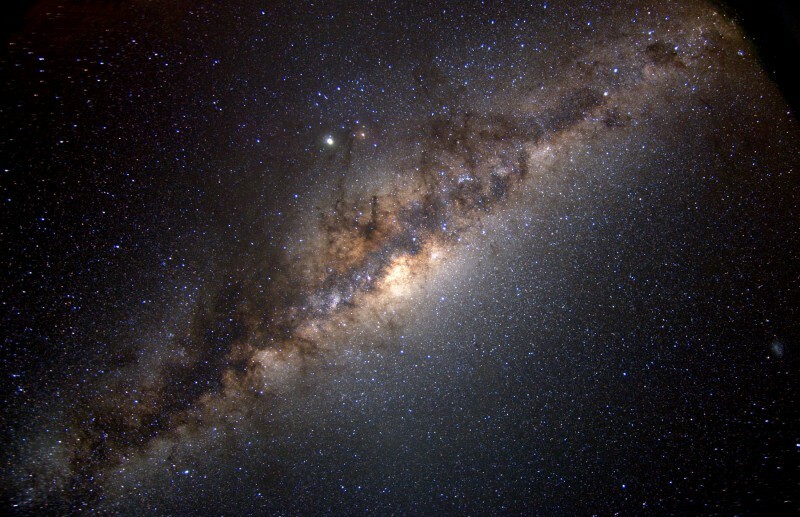 The current wisdom suggests we have somewhere between 100 and 400 billion stars in our galaxy. You’ll notice that this is not very precise. 300 billion stars is a pretty sizable number of stars to be able to throw around, even by astronomical standards, which are notoriously wobbly. Why is this measurement so hard? Fundamentally, it comes down to the simple fact that we’re inside the thing we’re trying to measure, and that the galaxy is a very complicated place. We can’t just go out into the sky and count the number of stars we see, add them all up, and get the right answer. As a first problem, that would take way longer than anyone is willing to spend counting stars. If you were to spend one second counting each star, and we’re right that there are at least 100 billion stars to count, you’d have at least ~3,180 years worth of work laid out in front of you. On top of that, the galaxy is full of a bunch of pesky gas and dust, which blocks out light from stars behind it. The gas and dust tends to be most dense within the disk of our Milky Way, which is exactly where we’re sitting. Any time we look along the disk of the Milky Way, our view is heavily obscured, so we’d be missing a large fraction of the stars just because their light never reaches us. So other than counting all the stars, what can we do? There are a couple methods left. A very crude way of counting is to take very detailed images of a few (hopefully low dust and low gas) patches of the sky - by proxy this is looking at a few patches of the Milky Way - and try to statistically piece the galaxy together. Look away from the disk, and how many stars do you see? How much area in space should look like that region? Multiply your density of stars by the area, and you’ll get out a number of stars in that area. Do the same thing again for a region of the galaxy near us, and near the center of the galaxy, and you can - approximately - work the number out, or at least get a sense of how big the number is likely to be. You can also take the total amount of light that is given off by the galaxy and try to work backwards to figure out how many stars you need to have to create that much light. We will again have the problem of gas and dust blocking out some of the light, but certain wavelengths of light allow us to see through gas and dust to some extent, and we can use information from those other wavelengths to try and correct for the dust. The bigger problem at this stage is that working from total light to a number of stars, you need to know how many of each size star you expect to make. If your galaxy is good at forming very big stars, these stars are also extremely bright, so you need fewer stars to produce the same amount of light than if the galaxy is good at making very small stars, which tend to be dim. You can add quite a few very small dim stars into the galaxy before you change the amount of light produced by the galaxy by a significant amount - which is part of why the total number of stars in the galaxy that we calculate out could vary by so much. Galaxies produce stars of all sizes, but the exact ratio of small to large stars is still something astrophysicists are trying to understand - or tell if indeed it is a single number. We use the stars very near to us to get a general idea of what the distribution is like, but the small faint stars are (unsurprisingly) hard to spot, so this is still a difficult thing to look for. Given how hard these measurements are to make, it’s perhaps less surprising that we have 300 billion stars worth of wiggle room in our numbers. Whether the answer be 100 billion or 400 billion, this is still an astounding number of stars, and given that we’re finding planets around almost every star, an even more astounding number of planets. Something here unclear? Have your own question? Feel free to ask! You can also submit questions via the sidebar, Facebook, or twitter!